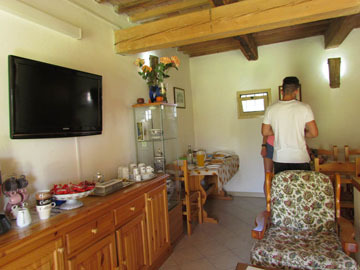 Immerse yourself in the welcoming family atmosphere at Fondo Riso, the cosy, rustic Room & Breakfast set in a typical Romagna farmhouse on the edge of Faenza. In our public areas you can use the kitchen, the lounge with sofas and TV, as well as our courtesy bikes and the large car park. 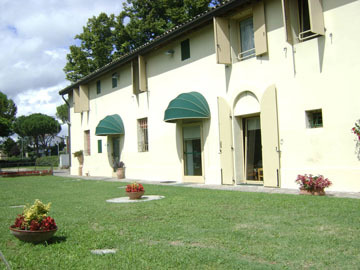 There’s also an extensive green area, always open for picnics and barbecues. The two small buildings outside are useful places for sports enthusiasts and travellers: a bike room for cycle and motorbike storage and a workshop for small-scale maintenance, while camper vans can enjoy a dedicated area with toilets and reserved pitches. 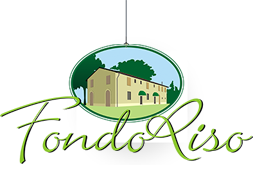 Fondo Riso is very close to the centre of Faenza: 14 minutes on foot or 5 by bicycle, and 1 km from the A14 Bologna to Rimini motorway.